If in good condition, leave asbestos material alone, because will not release asbestos fibers. 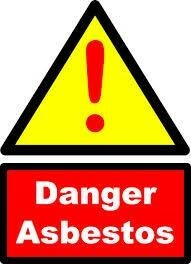 There is no danger unless the asbestos is disturbed and fibers are released and then inhaled into the lungs. Just check it regularly, but don't touch it. Look for signs of wear or damage, such as tears, abrasions or water damage. Damaged material may release asbestos fibers.